One of the best parts of a family reunion in Daytona Beach is the variety of activity options available for all ages. Even if your group spans multiple generations, the number of things to do in the area makes it easy to plan a reunion that will keep everybody happy! Another attractive feature of Daytona Beach is that it is so easily accessible, no matter where you’re coming from. It’s an easy and scenic ride for family members within driving distance, and Daytona Beach International Airport makes air travel super convenient for those coming in from a bit farther away. Of course, some of the best memories are created in seemingly insignificant moments. In Daytona Beach, simply spending time together on white-sand beaches can be the most perfect way to reunite the family. Splash around, go for a stroll together, get a snack at a food truck, or spend hours sprawled out in the sand giggling and reliving family stories. Grab your poles and head to the Daytona Beach Pier, a popular local fishing spot. There’s no cost to fish on this pier, and fishing licenses are not required, making it the perfect activity to pursue on a whim. Other fishing spots include Sunglow Pier, Ponce Inlet and Ames Park Fishing Dock in Ormond Beach, but be advised that some of these spots require small fees and/or licenses. Spend time with nature and each other on a paddleboard or kayak adventure! It’s likely you’ll get a close-up look at a variety of marine life, including dolphins, birds and even manatees. Paddleboarding and kayaking are eco-friendly ways to explore the immense water systems in the area, get some exercise and spend time together! There are several places you can easily rent equipment, and many tours include basic lessons, so you don’t have worry even if everyone in your group is new to the sport. Go for a cruise along Daytona Beach’s iconic 23 miles of wide shoreline. There’s plenty of room for your whole family here. In fact, your crew isn’t limited to riding on the beach at all. The Daytona Beach area has many parks and outdoor recreation trails that are ideal for accommodating large groups. Can’t fit your bike in your suitcase? No problem. Renting a bike is easy in Daytona Beach. Animal lovers and people of all ages will enjoy the touch tanks, educational demonstrations and sea turtle hospital at the Marine Science Center. It’s a fun place to learn about the environment and conservation located in Ponce Inlet. From dinosaur exhibits and prehistoric artifacts to a planetarium and an exclusive collection of Floridian-created art, there’s something for everyone to enjoy at the Museum of Arts & Sciences. Let the little ones explore the interactive learning exhibits of the Children’s Museum, or spends hours perusing the renowned Cuban, African and Chinese art collections, and the Root Family Museum of Coca-Cola memorabilia and Americana. This Smithsonian-affiliated museum will not disappoint. At the world-famous Daytona Beach Boardwalk, your family will find everything from street performers to arcade games to educational plaques. Centrally located on Ocean Avenue in Daytona Beach, the Boardwalk is the perfect place to bring the whole crew to relax and enjoy the beachside breeze for an evening. And if you’re here between May and September, you can even catch a live concert on Friday and Saturday nights at the Daytona Beach Bandshell! If you have any history buffs in your family, then opt for a self-guided driving tour of Daytona Beach’s top historic sites. It’s an ideal way to keep the kids engaged in an educational vacation without things ever getting too stiff or boring. From haunted houses to legendary stock car drivers, Daytona Beach features a myriad of rich and colorful stories. So load the car down with snacks, water bottles and your family members, and come experience all the historic sites in person! With entertainment, dining and shopping all within walking distance, spend the good part of a day can be spent exploring ONE DAYTONA. Located right across the street from Daytona International Speedway, this hub of family fun offers a number of options for hungry vacationers. The best part is that if you have picky eaters, ONE DAYTONA makes it convenient to grab a quick burger at one spot while the other half of the group eats pizza just a few steps away. Then, everyone can easily circle back together for live entertainment in front of the fountains, or perhaps some ice cream to top off the evening. If you have a big group with varied tastes, one thing everyone can usually agree on is a breathtaking waterfront view. Check out some of the top riverfront dining options in Daytona Beach! At an eatery like Our Deck Down Under, you’ll be able to savor fresh local seafood as the sun sets over the river. Or perhaps try Pat’s Riverfront Café, where breakfast is served all day and everyone can find something they’ll love — even dogs are welcomed on the patio! When you have a large vacation crew, sometimes, the most relaxing thing to do is find a venue where everyone can spread out and the kids are free to roam. Enter: Lighthouse Point Park. This sprawling park at the northern tip of Ponce Inlet features a number of activities that are fun for all ages. You can go fishing off the jetty, cool off with a swim, walk the nature trails, or make your way to the observation deck and tower. And, you can easily reserve a pavilion for grilling out and gathering together at Lighthouse Point Park. The park features four large pavilions, each equipped with either four or six tables. Lighthouse Point Park offers daily admission from sunrise to sunset for $10 per vehicle, or you can get an annual inlet parks pass for $20 — a price that’s well worth it for the natural beauty that awaits inside. With the wide array of accommodations and so many excursions and activity options available in Daytona Beach, everyone in your family is sure to be smiling! For a low-stress, high-fun family reunion experience, look no further than Daytona Beach. 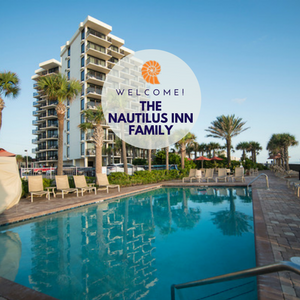 The Nautilus Inn is perfect hot facility for family large and small. The Nautilus Inn features a wide, expansive deck area with a variety of seating areas - perfect for conversation or just relaxation. Full-kitchen efficiency accommodations allows plenty of space to spread out and accommodate the needs for any age. And the Nautilus Inn's lobby is perfect for gathering the clan and our complimentary hot breakfast and afternoon cocktail hour give you group a chance to gather together care free! After all, the point of family reunions is to spend quality time with one another. Everyone knows about our Daytona's wide-open beaches and beautiful weather. Sometimes, nature doesn’t always cooperate, so it is wise to have alternate activities in mind should inclement weather arise. Staying at a hotel that offers an abundance of indoor activities and common space will save you from scrambling at the last minute to find entertainment for restless kids. Even better is staying at a resort that not only offers activities on site, but also is located just a short distance from family-friendly attractions and excursions. Having plenty of options is always a good thing when you’re traveling with a large group! The Nautilus Inn's location in Daytona Beach and central Florida offers another great benefit. When considering family reunion vacation ideas, think about staying at a hotel that is in close proximity to local attractions which provides a great opportunity for all ages to open their eyes to new and fascinating experiences, off the beach. 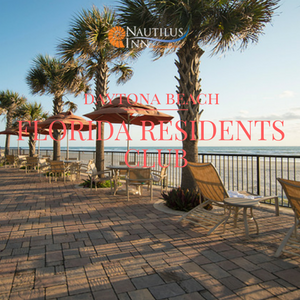 Daytona's large variety of activities from the Ocean Walk complex to the a short hour drive to central Florida's famous attractions makes the Nautilus Inn the perfect location for both beach and fun! When it comes to choosing a great family reunion location, the Nautilus Inn can’t be beat! For more information call (800) 245-0560 or view our latest Daytona Beach vacation offers!